Here’s why AAA Life might be the best choice for your family. Whether you’re just beginning to explore life insurance, ready to buy, or filing a claim, we’re here for you. Helping protect financial futures is our business—and we take it seriously. We provide a range of quality products and outstanding customer service. We’re dedicated to making the life insurance experience as easy as possible. It's our goal to provide you with the best life insurance coverage available, at a competitive rate. Our products are designed to help provide you with financial peace of mind without breaking the budget. Get started with a personalized quote for Term Life Insurance. Monthly premium for 10-year level Traditional Term policy, female, age 35, best class non-nicotine. Comparison of publicly available rates from Compulife and company websites. Rates were not furnished by these companies and you may contact them with any questions. Rates shown are current as of 02/13/2019 and are subject to change. We're dedicated to providing excellent customer service. 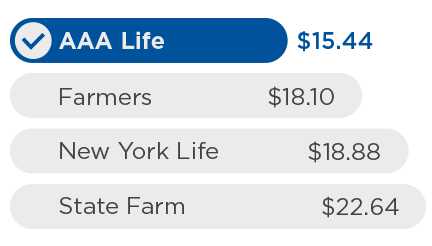 When you purchase life insurance from AAA Life Insurance Company, you'll have access to our experienced life insurance agents and member service advocates who will help you along the way. But we don't assume our customers are happy—we ask them! Recent surveys have shown that over 95% of our customers were satisfied (or better) with their experience with us. In an independent life insurance beneficiary survey conducted by LIMRA, a life insurance research organization, AAA Life received the highest overall satisfaction score for claims practices in 2015, among eight major life insurers. Additionally, we stood out with the quickest median time to pay claims and the highest likelihood that a customer would recommend AAA Life based on his or her experience. When thinking about buying life insurance, take time to consider the service after the sale, including the care your beneficiaries will receive. A positive claim experience will make a difficult time a little easier for the ones you care about.